Spicy Hut Indo-Chinese uses their own specialised couriers to deliver their food. Potato patty pan fried, served with tamarind sauce. Onion and spinach leaves in crispy lentil batter, topped with chat masala. Golden fried sliced eggplant with crispy lentil batter, served with mint sauce. Golden fried green chilli fritters stuffed with tangy paste coated with gram flour batter. Homemade pastry filled with potatoes, peas, spices and herbs. Tender chicken thigh fillet marinated with yoghurt and spices cooked in clay oven. Marinated deep fried chicken topped with curry leaves. Chicken marinated with yoghurt, ginger, garlic and spices cooked in tandoor. Tandoor cooked lamb cutlet marinated in a green herb masala of coriander leaves, spinach, mint & fresh green chillies. Minced lamb marinated with mild spices, mounted on skewer cooked in clay oven. Marinated fish fillet coated with gram flour and deep fried. Marinated fish fillets cooked in tandoor. King prawn marinated with spices, garlic and ginger cooked in tandoor. A selection of Tandoori specialties: Chicken Tikka, Hariyali Lamb Cutlet, Prawn and Sheek Kebab. Diced lamb or beef cooked with spinach puree flavoured with garlic and cumin seeds. A popular preparation of lamb curry from North India with rich gravy finished with coriander. Diced lamb stir-fried with tomato, coconut-based sauce flavoured with curry leaves. 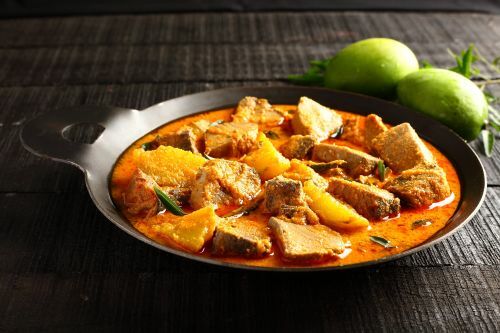 Delicately tempered lamb or beef cooked in special combination of spices and coconut milk. Diced lamb or beef simmered in a spicy sauce. Beef cooked in Madras style with special combination of spices in gravy. Chicken cooked with spinach puree, flavoured with garlic and cumin seeds. Diced chicken tikka, capsicum and onion cooked in tomato, yoghurt based tangy sauce. Fresh marinated chicken cooked in tandoor and slow cooked in cream tomato-based sauce. Chicken thigh fillet slow cooked in mango puree-based sauce. Chicken cooked in spicy tomato sauce studded with stir-fried peppers and onion. Tender pieces of meat are cooked in ground cashew and creamy sauce. Chicken cooked with kadai vegetables. Diced eggplant cooked in tamarind flavoured onion sauce. Black lentils and kidney beans cooked with tomatoes and dried fenugreek leaves. Yellow lentils cooked with tomato and onion tempering. Boiled potato and cauliflower stir-fried with spices. Cubes of paneer (cottage cheese), onion, tomatoes and capsicum simmered in a spicy sauce. Paneer (cottage cheese) cooked with creamy tomato-based sauce. Variety of vegetables cooked in almond creamy sauce. Okra, tomato and garlic cooked in chef’s special style. Cottage cheese cooked with spinach puree, flavoured with garlic and cumin seeds. Dumplings of cottage cheese and vegetables blended with mild spices in creamy sauce. Fresh barramundi fish fillet cooked in coconut milk with onion and tomato sauce. Fish made in Madras style cooking with ground spices, topped with dry red chilli and curry leaves. Prawn cooked in one of the spicy South Indian chettinad masala. King prawn cooked in chef’s special sauce. Prawn cooked in Kerala style influenced, topped with curry leaves and mustard seeds. Mixed seafood slowly cooked with Goan ground masala, curry leaves, mustard and coconut milk. Frenched chicken winglets coated in spicy red batter and cooked to a deliciously crispy finish. Batter fried pieces of cauliflower tossed with Indo Chinese sauce and herbs. Chinese inspired stir-fried cottage cheese pieces cooked with onion, capsicum and soya sauce. Delicious paneer cubes cooked in medium spicy tomato cream, ginger and almond sauce with capsicum, onion and fresh coriander. Chinese inspired stir-fried chicken pieces cooked with onion, capsicum and soya sauce. One of our most popular dishes, made in its authentic style. Plain naan bread topped with Nutella. Plain dosa bread topped with Nutella. Aromatic boiled plain Basmati rice. Aromatic Basmati rice tempered with ghee and cumin seeds. Aromatic Basmati rice with saffron flavour and cumin seeds. Basmati rice cooked with mixed vegetables flavoured with rich spices, coriander and mint. Delicious medley of marinated bone-in chicken, ghee, saffron and flavoured basmati rice layered, slowly cooked in dum style. Delicious medley of marinated boneless Chicken 65, ghee, saffron and flavoured basmati rice layered, slowly cooked in dum style. Delicious medley of marinated meat in ghee, saffron & flavoured basmati rice layered, slowly cooked in dum style. Delicious medley of marinated meat in ghee, saffron and flavoured basmati rice layered, slowly cooked in dum style. Flavoured basmati rice cooked with barramundi fish with rich spices, coriander and mint. Flavoured Basmati rice cooked with prawns with rich spices, coriander and mint. Indian wholemeal bread baked in tandoor. Plain flour Indian bread baked in tandoor. Naan stuffed with potato and herb. Wholemeal bread stuffed with potato and herb. Cheese naan topped with garlic. Naan stuffed with minced lamb and spices. Naan stuffed with minced chicken and spices. Naan enriched with nuts like sultanas, almonds etc. Crisp pancake served with sambar, peanut and coconut chutney. Crisp pancake with a filling of mild potato masala with sambar, peanut and coconut chutney. Crisp pancake with a filling of finely chopped onions with sambar, peanut and coconut chutney. Beaten eggs spread over crispy pancake with sambar, peanut and coconut chutney. Crisp pancake stuffed with lamb mince with sambar, peanut and coconut chutney. Indian style mixed vegetable pickle with spices. Indian style lime pickle with spices. Indian style mango pickle with spices. Salad of cucumber, tomato and onion with spices. Salad of cucumber, tomato and onion with yogurt. Combination Raita, Mango Chutney and Mixed Pickles. Saffron and cardamom flavoured homemade Indian ice cream. Dumpling of cottage cheese and flour, deep fried and soaked in sugar syrup. Soft cottage cheese patties immersed in chilled creamy milk.